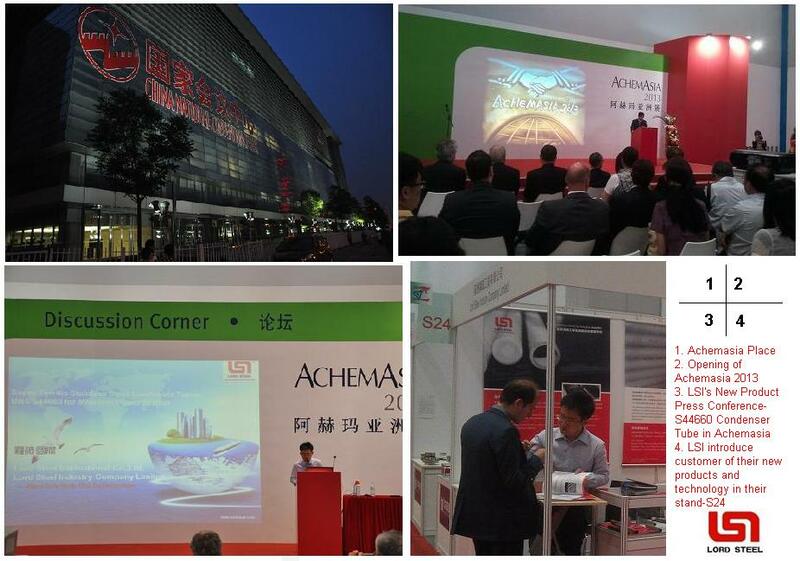 As one of most important expositions in the world, Achema has been viewed as a new windows for global excellent manufacturers to introduce their products to customer all over the world.This time, Achemasia happens in Beijing and continue their goals to the market. LSI bring their new products-S44660/S44735 Super Ferritic Stainless Steel Condenser Tubes in the conference this time for Achemasia, Mr.Bill Chow in LSI introduce the development of UNS S44660 Super ferritic stainless steel condenser tubes, the success application of UNS S44660 in modern power station, the excellent property of UNS S44660 Super ferrtic stainless steel and comparison of Super Ferritic Stainless Steel with Super austenitic Stainless Steel,duplex stainless steel,nickel alloy,copper alloy and Titanium in the power station condensers and prove that UNS S44660 is the best choice for modern power station with economic and safety elements and alternative material to traditional Titanium Gr.2 and copper alloy here. After meeting, there are many customers in our stand to ask for more information about UNS S44660 Super Ferritic Stainless Steel Condenser Tubes, We believe that it will bring to our customer more profit for their equipment under sea water or brackish water environment. LSI are sincerely looking forward to building business relationship with you if you are interesting in us. Please do feel free to contact us.